So, I thought "put your money where your mouth is" since I suggested Pre-Listing Appraisals in order for all 3 top seller concerns to be met. Based upon our pre-listing appraisals in 2018, the sellers who placed their homes on the market and listed them CLOSE to our appraised value, the Days On Market for these homes (many of them lakefront) averaged 34 days! The average for similar properties is around 50-60 days. In 36% of the cases they sold in 10 days or less. In only 1 case over 120 days. In some cases the owner got more than their listing price as they priced it very well. In the cases where the owner decided to list WELL over our appraised value (meaning over 10% of value) not a good story! Longer DOM than typical and price reductions, sometimes several. In many cases they changed REALTORS! Not good! When that 2nd Realtor listed closer to appraised value...Bingo they get the SALE & commission! So for 2019, consider a Pre-Listing or POST-Listing Appraisal if your home is on the market longer than 60 days. This could be your bullett proof marketing tool to close more deals quickly. We hope 2019 is one of your best years yet, but in order for that to happen you have to pull a few tricks out of the marketing bag as all indicators are that the market is slowing a bit for 2019 with 2020 the possible start to some major corrections! HERE IS WHAT ONE SELLER HAD TO SAY WHICH SUMMARIZES WHY A GOOD PRE-LISTING APPRAISAL IS SO VALUABLE AND IMPORTANT. "My mother passed away leaving a house on Lake Lanier. We had no idea as to the value of the home so we had an appraiser come out and was very disappointed in the value that he appraised the home. I read reviews about Mary Thompson and Lanier Appraisal Service and decided to give her a call. So glad I did. She really knows the area and home values. She was very professional and caught several things the previous appraiser missed, like the view, dock and deep water to name a few. We are very happy with her appraisal and was able to sell the house within a week. If you have property or a home on Lake Lanier make sure you get an appraiser that knows the area and the lake or the values will be negatively impacted. 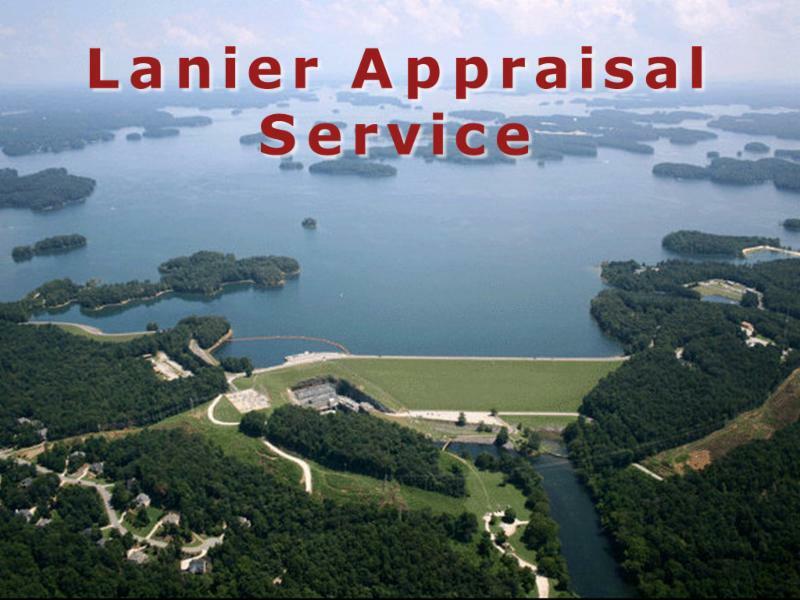 I would definitely recommend Lanier Appraisal Service. Thank you Mary for all your help." As a Realtor you may think great, NO appraisal! No worries..Not so fast! As a Buyer you may think great no appraisal...that saves me money and that must mean the home I am purchasing is worth what I am paying....Not So Fast! What is a PIW? (It is a misnomer for one). It means that Fannie has decided the buyer and property are a good risk and waives the Appraisal on the home. They accept the estimate of the home provided by Lender as valid. "A prior appraisal has to be in the Fannie MAE CU (Collateral Underwriter File...for a waiver to be offered)." THIS PRIOR APPRAISAL MAY OR MAY NOT BE ACCEPTABLE FOR A HOST OF REASONS and a prior apraisal should NOT in my opinionhave any bearing on a CURRENT valuation of the property. So you are a Realtor and you are thinking great I do not have to worry about an appraisal killing my deal. IF you are a Buyer's Realtor you need to have their best interest at heart and not let them over pay or it could come back to haunt you. In this law suit happy world you need to be very careful. If your buyer gets a PIW on that loan at the very least you need to suggest to the buyer to get their OWN appraisal. Then you need to document your file and let them decide. As part of the recommendation you need to tell them that a PIW does NOT mean the home is CURRENTLY worth what they are paying since they are relying on prior appraisal data and other valuation vehichles other than an appraisal. The only way a buyer truly knows current value is by getting an appraisal OR taking your word for it based upon your data. Not a wise choice because if later down the road they decide they paid too much and no one told them that they had the choice of getting their OWN appraisal, guess who they will come after first...THE REALTOR. As a buyer, many may think the lender has decided that their home is worth the sales price. This is NOT true. They are relying on prior data that may be flawed and outside valuation sources and not an actual appraisal. So while many may be thrilled with the prospect of a PIW. Think twice, protect your buyers and do the right thing! ADVISE your buyers to get their own appraisal and then if they decide NO, you have done your duty to so advise. This should also be the case with CASH buyers! 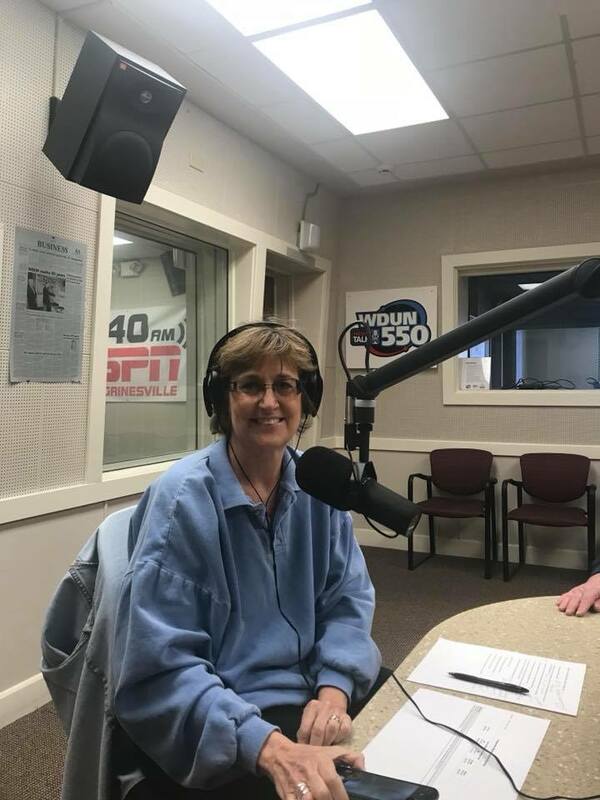 "Hey, let me tell you all; Mary Thompson is one of the most professional and nicest people that I have had the pleasure of doing business with in some time. Mary was always prompt to respond; did everything, and I mean everything she promised to do. Also, her work is very impressive to say the least. I can say without a doubt, she is the go to person for property appraisals on Lake Lanier. Mary has helped us greatly with her deep experience and expertise"
As a Buyer's Realtor you want to make sure your client is not overpaying for one of the largest investments of their life...Their Home! As an Appraiser, I do not like to see a large gap between intrinsic value and market value. What is the difference and why does it matter? Intrinsic value: What does that home really offer to the buyer, without outside influences taking hold. Things like square footage, location, lot, quality, condition, style, appeal, etc. Market value on the other hand is what a willing seller and willing buyer (both acting with reasonable knowledge of the market and under no undue distress) agree to on a sales price. Technically, Appraisers are reporting market value for a property. However if that sales price is LESS about the property and more about outside influences, that can lead to market corrections later on where the buyer will LOSE! Right now I am seeing a larger gap than is preferable in some markets. So what are the top influences which make a buyer want to pay more than intrinsic value? If buyers are willing to pay MORE than the home is actually worth intrinsically, this defines a new market value for the area which is based upon what I like to call a very shaky foundation. So, my appeal to all Realtors and Buyers out there.....focus more on intrinsic value rather than market value (actual sales prices). If they are close to each other, you can feel safe with the investment. If however, they are far apart, buyer beware as your investment may not be as solid as you might think! Thanks for reading......and as always....Thank you for your referrals! Intrinsic value vs. Market Value. What's the difference. As an Appraiser, I do not like to see a large gap betweenintrinsic value and market value. What is the difference and why does it matter? If buyers are willing to pay MORE than the home is actually worth intrinsically, this defines a new market value for the area which is based upon what I like to call avery shaky foundation. 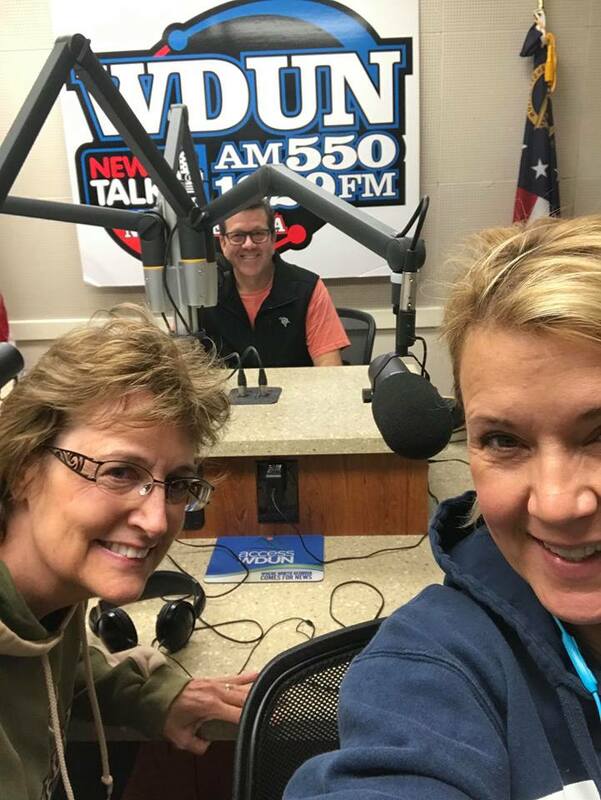 Had a great morning on WDUN Talk Radio 102.9 FM talking with hosts and local Realtor Kim Waters about Real Estate and Appraisals. Very good information and exchange for the listeners. Doing it again December 1st. Thanks to the Home Improvement Show hosts Tracy and Steve and Kim for the invite to be on the show. 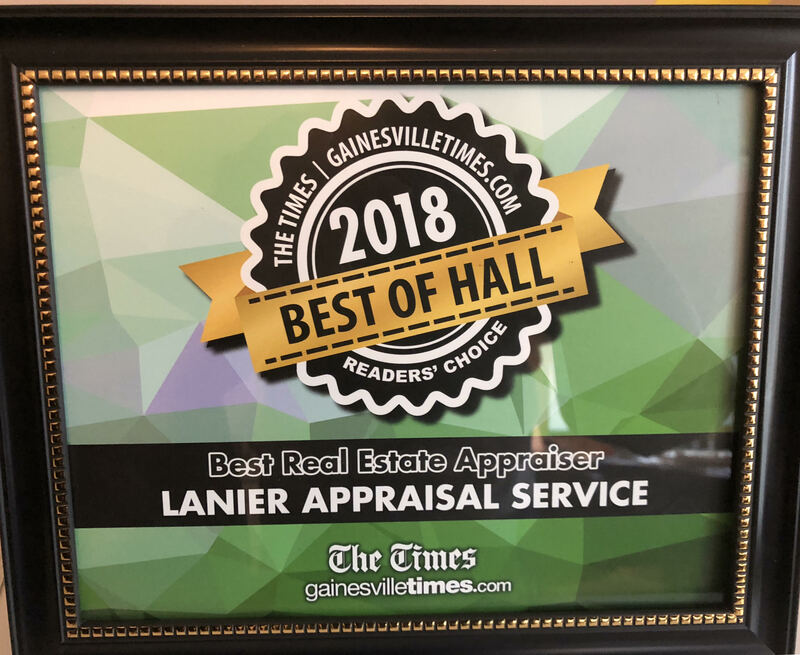 Thanks to the people of Hall County, GA who voted Lanier Appraisal Servicethe BEST Real Estate Apprasier in Hall County, GA. We are humbled and we thank you. Thank you to THE GAINESVILLE TIMES for putting on a great party for all the winners in their respective business categories! As a Real Estate Agent or Homeowner, value per square foot is how you determine listing prices...right? Not so fast! As an Appraiser I do not even look at the price per square foot until AFTER I have determined the value of the Subject property; which is determined by who? Not the Appraiser but the MARKET. After I have determined the value of the Subject, if price per square foot is way off from the other sales then I must look at other contributory factors causing this number to be off. This is a complex problem that is for the Appraiser to decide. So what do YOU do as a Real Estate Agent or Homeowner. 1. Sales Price / Square Footage = price per square foot. Example: You have a $200,000 sales price with 1,800 square feet which equal $111.11 per square foot value. Did you check my math? GOOD, I wanted you to do that! While the sample above seems quite easy, the problem lies in what ELSE is considered in price per square foot? The lot value, the quality, condition, basement size and finish, out buildings, pools, etc. All of these are considered in the price per square foot. Unless you are dealing with a "cookie cutter" home in a development where all the lots are basically the same size and same value and the homes are similar in square footage and quality, using price per square foot to SET your listing price is a mistake without further work needed! If you are dealing with Lakefront property, price per square foot flies right out of the window because the land or site value is in many cases the lions share of the total value. Same holds true if you are dealing with Acreage, Golf Course homes or homes with mountain, river or other water views. So what do you do in order to set price? You must FIRST and foremost determine the value of the LAND or DIRT that the home sits on. This is crucial. Then compare that to the other comparable sales you are reviewing and their lot values. Once you subtract the site values from these sales, you can deal with the remainder of what the property offers. Hopefully you are working with homes that are at least close in size, quality and condition, otherwise you have to extract those values from the other sales to make them EQUAL to your Subject property. A much more involved process and that is where an appraisal comes in handy! Once you subtract that land value from the total Sales price using the sample above, if the lot is worth $40,000 you now have a working number of $160,000 for the home ($200,000 - $40,000). Now divide the total adjusted sales price of $160,000 by the 1,800 S.F. and you get $88.88 per square foot for the home or improvements to the site as Appraisers call them. That number is the true MARKET VALUE per square foot for this home. When you review the appraisal report their adjustments for square footage variances, should approximate this number, assuming you have subtracted all other factors about the improvements which could rise that number unduly, such as outbuildings, barns, pools, etc. Remember we are NOT talking Cost to build per square foot since the market typically does not pay the FULL price per square foot on resale homes. The process above is a very BASIC, but workable approach for you to set the price per square foot for the home you want to list. Thanks for reading and please feel free to SHARE by clicking the forward this email link below. When you do not want to deal with this process, call us for a Pre-Listing Appraisal. This makes yours and your sellers lives alot easier! This also takes the pressure off you as an Agent to come up with a good listing price for a home which is solid and realistic. Have a great Holiday Season! As always we thank you for your referrals. Appraisers review FMLS/MLS listings every day including all photos, commentary, etc. What you do and say in those listings not only helps your Seller get the highest possible price, but it can also mean higher Appraised Values and fewer calls from Appraisers! You would be surprised how many Listings I see that fall short of the below suggestions. First rule of Thumb: Pretend you are selling YOUR own Home. Some of the best listings I see are Owner/Agents. Do your Sellers a great service and give them the same attention to detail as you would your own home. The more Appraiser's have with regard to the Property the better chance for positive results on the Appraisal. 1. PHOTOS: Clear, sharp, high resolution photos: Include as many photos as the Listing will accept. Inside photos should include at the least; Living/Family Room, Kitchen, Master Bedroom, All Baths, Dining Room, Basement Rooms and All Special upgrades and features of the home Inside and Out. You do not need a professional photographer but when someone goes to CLICK on your photos in FMLS/MLS they need to be large enough to see the details. Virtual Tours of course are a plus. * If you are dealing with Lakefront, Golf Course, Mountain View Homes, PLEASE include a view of these amenities from the REAR of home from the Deck or Patio. This is very important for the Appraiser and the Buyers to get a feel for what their views are FROM THE HOME. For Lake of course always include views of the lake from the Boat dock, the boat dock itself, the views straight out from the dock, to the Right and to the left of the dock and toward the home so you can see things like Rip Rap shoreline and how close the home is from the dock as well as the path to the dock. * Please UPDATE your photos for the Current Season. Nothing screams this home has been on the market a long time than a Winter Time Photo in the Summer. 2. In your description of the property under PUBLIC comments, include all major renovations & approximate year. If you have total costs of all renovations include those as well. *Sample: Lakefront home with year round views. Renovations include: New HVAC:2012; New Roof: 2015: New Appliances: 2010; New Floor coverings: 2011. Owner put over $50,000 in total renovation in past 6 years. Include anything that is not obvious in the photos and any special amenities. Then refer them to commentary under each photo. Since you are limited in your Public Remarks section use that section below EACH photo for more information; i.e. ; Under your Kitchen photos if you have upgraded appliances say something like this: "Wolf Stove, Dacor Dishwasher, Sub-Zero Refrigerator" The more details the better both for the Buyer and the Appraiser so that they can give credit where credit is due to upgrades in the kitchen or the home in general. This kind of commentary is good for every room in the house that includes any kind of special features that may not be obvious in the photos themselves. Leave NOTHING to chance. You have the room to spotlight the home, use every bit of it for the best result. 3. DIRECTIONS: Please do not just say USE GPS in that space. There may be some Appraisers and Buyers who actually do not have GPS or their GPS may be out of date on certain streets, etc. PLEASE list out turn by turn direction to the property. Appraisers have to drive by all Comparables, so clear directions is always appreciated! Buyers will like them too. 4. Please be very careful to list all amenities about the Listing correctly in FMLS/MLS as the Appraisers use this information in their reports not only for the Subject but for the Comparable Sales. 5. SQUARE FOOTAGE/SOURCE: Please do NOT state "Appraisal" in this field unless you have an actual Appraisal on hand. If you get this from Courthouse Records State "TAX RECORD". You do not want another Appraiser using "The Appraisal" number against your Listing if indeed the Tax Record includes square footage in the basement (which many times they do). This could result in a REDUCED value for your under contract Listing!
" 3,450 total square feet all levels; 1,550 is in the basement and 1,000 of that is finished" OR if you have Appraisal say something like: 2,450 S.F. on the upper level/s and another 1,250 in the basement of which 1,025 is finished. Total heated: 3,475. IF YOU RUN OUT OF ROOM UNDER COMMENTS, PUT THIS UNDER YOUR BASEMENT PHOTOS ON THE LISTING. "Priced to Sell" : I don't know why, but this is the Kiss of Death. In almost every case when I see this I look at days on market and it has been on the market longer than average. Isn't the whole idea to price homes to SELL? Do you really need to say this in a listing? Use this space to outline more features of the home. "Won't last long": Again many times I see this and Days on market are longer than typical. If you DO say this.....if that home is on the market for over 30 days, remove that wording. 7. Use those attached documents in your Listings to your advantage in the Listing. Include the DISCLOSURE STATEMENT ALWAYS. It is very helpful for Appraisers as well as Buyers. We need to know how old components are in the home up to 15 years. Also include PLATS. Very helpful for Appraisers. 8. Site Section/Description: I see many times where it lists Cul-De-Sac, when it is not. It may be on a cul de sac street further up, but not IN the cul de Sac. So technically is should not say cul de sac. 9. I know it is hard to be CREATIVE in all of your listings and not fall into the same "pat phrases" but try to point out that special thing or things about the home that set is apart from its competition and make it something that buyers want to see and Appraisers will appreciate about that home. 10: Lakefront Property: If the home is permitted for a larger dock note that in comments section of Listing. This does make a difference on Lake Site Value (permit type). ** Please do NOT state DEEP WATER Dock or especially Drought Proof if it goes dry in droughts of under 10 feet. I see this wording many times and when I pull it up on Google Aerial, which other Appraisers and Buyers will do and see Dirt under the dock, Deep Water does not seem to accurately describe this lakefront lot. I see this more times than I care to Admit. ** If you or the owner has measured the depth behind the Dock, then state that amount in the Listing. If we are below Full Summer Pool, you can also state that, i.e. ; "Dock has 13 feet of water behind the dock with Lake down 2 feet"
This is it for now. Remember, sell it like it is your own house and you can't go wrong! Thanks for Reading and Feel free to SHARE with your office. Click the link below for the Blog on this important topic! How will appraised values keep up with increases in the market?